PNNL scientists Emily Mace and Jesse Ward teamed to explore the promise of deep learning to help interpret signals from radioactive decay events, which could indicate underground nuclear testing. Mace, with the Low Level Radioactivity Measurement group in PNNL’s National Security Directorate, presented their work at the 11th Methods and Applications of Radioanalytical Chemistry, or MARC, conference held this April in Hawaii. Deep learning enables machines to learn and make decisions without being explicitly programmed for all conditions. 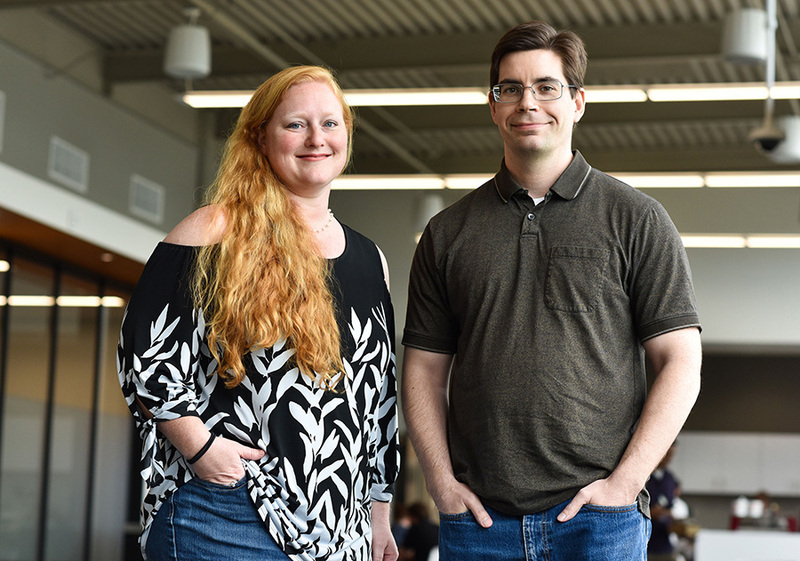 Emily Mace (left) and Jesse Ward (right) revealed that deep learning has useful applications in signatures science. Enlarge Image. To verify nuclear treaties, scientists analyze gas samples for specific types of radioactivity. Changes in levels of argon-37, for example, may indicate prior nuclear test activity, which could represent treaty violations. Mace is an expert in interpreting radioactive decay signals, including their energy, timing, peaks, slopes, duration, and other features. The challenge is that the signal hides among the “noise” of all other signals created on the planet, natural and otherwise. Mace wondered if deep learning could help. She sent Ward information on nearly two million energy pulses detected in PNNL’s Shallow Underground Laboratory since it opened in 2010. Ward, who is part of NSD’s Mass Spectrometry group, trained the network, inputting many features of each pulse and showing the network how the data were interpreted. The research results were impressive. Tests showed that the deep learning techniques separated signal events from instrument “noise” with nearly 100 percent accuracy and performed 25 times better than current computational methods when sorting the very toughest cases. To learn more about deep learning for enhanced data detection, check out the video. For more about deep learning research at PNNL, visit the website.